Fortified powdered drinks offer a convenient alternative to smoothies and other nutritional beverages. Since most powdered drinks are meant to be dissolved in water, it is possible to meet your recommended daily water intake of 2 to 3 liters by adding water to your powdered drink mixes. For best results, measure the amount of water that you add to each beverage to make sure you are receiving enough water for the day. Powdered drinks come in a variety of flavors and styles. While whey protein powder is one of the more common powdered beverages, powdered drinks can be made using a multitude of fruits, vegetables, herbs and other ingredients. According to a report published in a 2006 issue of the “Journal of AOAC International,” fortified powdered drinks can be made to contain supplemental quantities of vitamins and minerals, including vitamins B-2, B-5, B-6 and C. While most powdered drinks can be mixed with beverages such as milk or juice, water is the most reliable choice for replenishing your fluids. Since most powders quickly dissolve after mixing with water, powdered drinks are mostly comprised of water. According to the World Health Organization, the average woman requires 2.7 liters and the average man 3.7 liters of water each day to meet their body's needs. If you regularly engage in strenuous physical activities – such as sports or athletics – you may require more water in order to replenish your fluids each day. One common method of gauging your daily fluid intake is to make sure you drink at least eight 8-ounce glasses of water each day. Since powdered drinks contain mostly liquid, an 8-ounce glass of water mixed with a powdered drink mixture can count towards your daily water requirement. So long as you mix your drink with water instead of milk or juice, your powdered drink can be counted towards your water intake. However, some powders may contain ingredients that can potentially hinder your daily hydration goals. For example, if your powdered drink contains diuretic substances, such as dandelion leaves, it may have a dehydrating effect on your fluid levels. 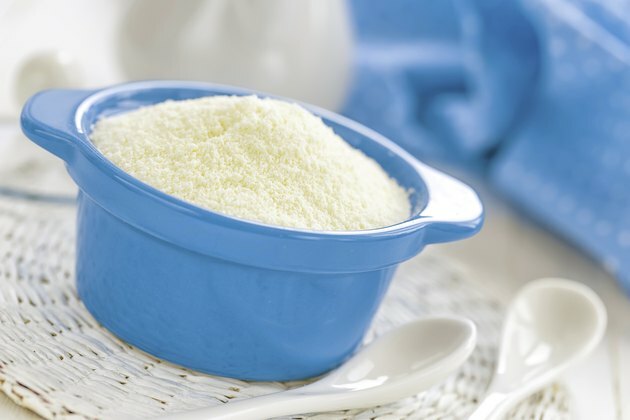 Depending on the ingredients, your powdered drink may also have other effects, such as greatly increasing your intake of calories, protein or fiber. For best results, review the nutrition facts listed on your product’s label for advice on how much you should drink. Talk to your doctor if you are concerned about your current hydration levels. Depending on the ingredients in your powdered drink mixture, you may want to limit your consumption to one serving a day. You should be particularly careful with your daily consumption when taking powdered sports or energy drinks, which may contain high levels of stimulants like caffeine and sugar. Is it Better to Drink Milk in Protein Shakes?